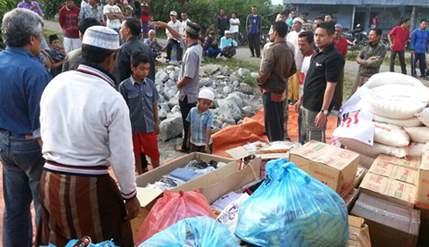 ACEH TENGAH, 26 Sept 2013 – A number of organisations and bodies from The National University of Malaysia (UKM) distributed aids to victims of an earthquake in Kampung Cangduri, Ketul in Central Aceh district today. The earthquake measuring 6.2 on the Richter scale on July 2, had destroyed Kampung Serempah, a village in the Ketul area here and caused the death of 30 people of the village, destroying three mosques, hundreds of dwellings and public amenities. Four other victims are still listed as missing. Assistance to the 600 victims were handed over by a team headed by Deputy Director of the Centre for Corporate Communications of UKM (PKK), Abdul Razak Hussin. Others in the team are UKM Zakat Unit Head, Mokshin Tumin, Muhammad Tajuddin Abd Rahim from the Zakat unit and Khairil Khuzairi from the Islamic Centre. They were joined by Abdullah Wahab, Manager of Al-Ain Orphanage from Banda Aceh. Journey to the disaster area took them 14 hours by four wheelers. It was organised to show their concern over the hardships faced by the victims and to distribution contributions collected by various units and bodies of UKM consisting of the Zakat Unit, Islamic Centre, Secretaries Association, SUKMANITA, UKM Holdings, REXPO, Science Officers Club, Academic Staff Association, Surau Al-Kautsar Bangi, PERTADI, KESUKMA and other UKM staff and individuals. Funds collected were used to purchase rice, sugar, cooking oil, school uniforms for distribution and various fittings for the temporary surau built there which is used for religious classes for students. The village head was thankful to the various bodies from UKM for their concern and assistance and hoped that they could be further assisted in building a new mosque costing some RM150,000 which will also be used as a madrasah.